Hope you all grabbed a copy of this year's Wedding Resource Guide from the Seattle Wedding Show! But don't worry, if you didn't, there will be some more fun opportunities for you to snag one. We'll be sure to let you know when and where! In the meantime, enjoy this lovely wintery white and green wedding inspo board! While we're in the midst of Winter, we thought it would be the perfect time to draw on Winter elements with another beautiful insporation board. 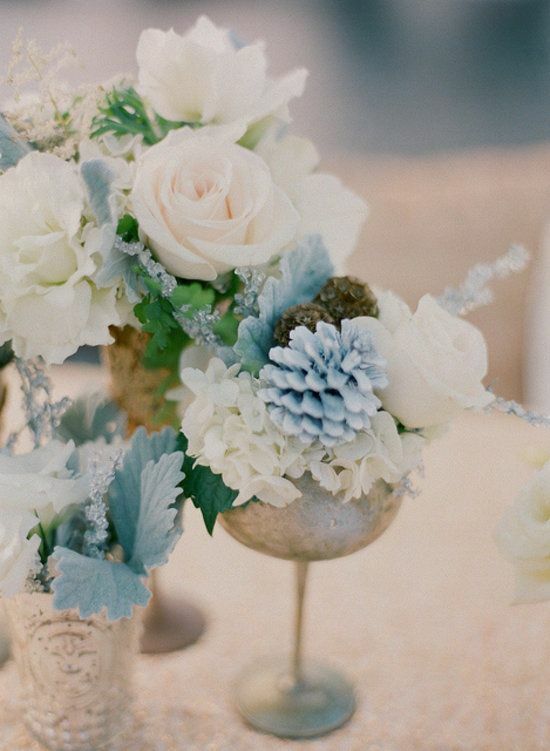 This dreamy light blue inspo board makes for the perfect Winter wedding palette! We are always in awe of how beautiful a Winter wedding can be! Check out this amazing red winter wedding inspo board! We love the stark contrast of white and red! Just look at this stunning red winter wedding inspiration! So festive and cheery! Using these pretty reds, whites and greeens make for a beautiful holiday palette without being cheesy! If you're going to jump into a seasonally themed wedding, don't forget to add some special touches! Just take a look at these wonderful Winter wedding cakes. You can't go wrong by adding some sprigs of pine or chocolate trees! Check out our cakes and desserts section to find a local cake shop for your wedding cake needs!
" The world of white wedding possibilities is explored and enhanced in a fresh way. A carefully curated design filled with textural play, modern minimalism and metallic accents create a scene that is far from boring Florals are wild and editorial - an edgy vibe on top of classic and beautiful table settings. Simple white becomes incredibly beautiful and dramatic. " to see a list of vendors and more pics from this venue click HERE!